Most freelance writing markets promoted here revolve around nonfiction writing. But plenty of outlets are interested in your more creative writing as well -- such as poetry. 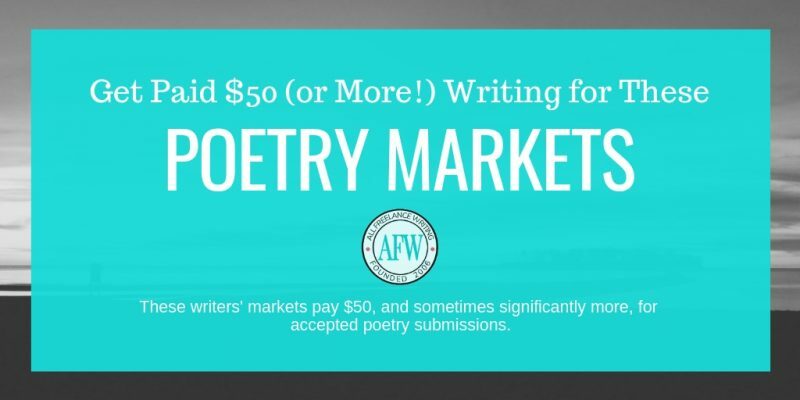 These poetry writers' markets can pay $50, and sometimes much more, for accepted poems. Like other market lists at All Freelance Writing, be sure to check this one often if you're looking to become a published poet. Because my market lists connect to the site's larger writers' market database, they update automatically any time an outdated listing changes or gets removed, and whenever new markets fitting their criteria get added. Whether you're a new poet or someone who has written poetry for years and is seeking new outlets for publication, I hope you find something in these poetry writers' markets that's a good fit. And remember, you can click the "markets" link at the top of any page to browse the full writers' market directory. There you'll find even more poetry markets that didn't happen to meet the payment requirements for this post. If you come across a dead market link in between my broad directory checks, just click "report link" below the listing and a pre-populated report email will come up. Hit send in your email system and the market will be checked and updated if necessary shortly after. Blue Mountain Arts seeks poetry and other writing for the company's greeting cards. Payment is $300 per poem for exclusive worldwide rights for greeting cards and other products and $50 per poem for one-time use in a book. CICADA is a YA/teen literary magazine that accepts fiction, poetry, comics, and essays. Fiction (up to 9000 words) pays up to $.10 / word; nonfiction (up to 5000 words) pays up to $.25 / word; poems pay up to $3.00 per line with a $25 minimum payment. Cricket magazine is target towards children from ages 9 to 14. It features fiction,poetry and nonfiction. Types of fiction they look for include folk tales, sci-fi, historical fiction, and contemporary fiction. Nonfiction pieces and poetry can be on a variety of topics. The rate is up to $0.25/word for stories and articles and up to $3.00 per line (minimum of $25) for poetry. The majority of stories and articles are 1,200 to 1,800 words though they also need 600-900 word shorter stories, and most poems are 8-15 lines. Activities and recipes pay a flat rate of $75. Ladybug is a magazine for ages 3 to 6. They look for short works of fiction (maximum 800 words), rebus stories (up to 200 words), and nonfiction (maximum 400 words) that pay up to $0.25/word. They also accept poetry (up to 20 lines) that pays up to $3.00/line with a $25 minimum payment. Our Times is a Canadian magazine covering independent labour. 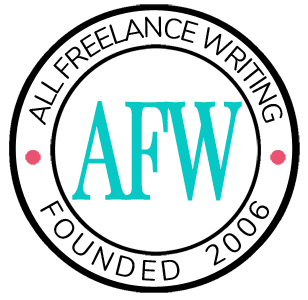 They accept features of 1500-3000 words, commentaries of 850 words, reviews of 600-1000 words, poetry, and submissions to its "Working for a Living" short story series (2000 words or less). Published poems pay $50, short stories pay $100, and for nonfiction small items pay $25, reviews pay $50, and features pay $200-300. Poetry accepts original and unpublished poems in English, or translations into English. They only accept online submissions. They pay $10 per line for poetry (with a minimum payment of $300), and $150 per page for prose. Submissions are limited to 4 poems and shouldn't exceed 10 pages. Rattle accepts unsolicited poetry submissions year-round. They do not accept previously-published work (but publishing to the author's own blog, message boards, and social media accounts are not disqualifying). They encourage simultaneous submissions. Pay is $100 per poem and a one-year subscription if the poem is published in print, and $50 for online contributors. Strange Horizons is a magazine that publishes speculative fiction as well as poetry, interviews and reviews. The pay is $0.08/word for fiction and stories must be less than 10,000 words, though below 5,000 is preferred. The Fiddlehead accepts unsolicited works of fiction, creative nonfiction, and poetry (including translations into English). They also publish reviews and some other creative works such as excerpts of plays. Submissions are accepted at any time via mail or during two Submittable reading periods, with an acceptance rate of around 1-2%. Short fiction and creative nonfiction should be a maximum of 6000 words. Up to 6 poems may be submitted at one time. Pay is $60CAD per page, with reviews paid at $40 per page. The Gay & Lesbian Review publishes essays, reviews, interviews, and poems. Feature articles should fall in the 2000-4000 word range, and reviews should be 600-1200 words. Payment for feature articles is $100 and payment for book reviews is $50. They also accept interviews, artist profiles, art memos, and International Spectrum column submissions. The Malahat Review accepts poetry, fiction, and creative nonfiction submissions from writers at all levels of their careers. Poets should submit 3-5 poems up to 6 pages maximum. They accept flash fiction up to 750 words as well as other short fiction up to 8000 words. Creative nonfiction can run up to 4500 words and cover any subject matter including personal essays, memoirs, narrative nonfiction, social commentary, travel writing, historical accounts, and biographies. Payment is $65CAD per published page. Their Publishing Tips column pays a $50 honorarium for submissions up to 750 words. The Sun publishes essays, fiction, and poetry on political and cultural issues. Payment for nonfiction is $300-2000. Payment for fiction is $300-2000. Payment for poetry is $100-250. They purchase one-time rights. The Threepenny Review accepts critical articles dealing with books, film, theater, and art exhibits(1200-2500 words), Table Talk items (1000 words or less), stories and memoirs (4000 words or less), and poetry (100 lines or less). They pay $400 per story or article, and $200 per poem or Table Talk piece. Online quarterly magazine for new writers. Previously unpublished writers preferred, though each issue includes at least one featured writer who is already published and agrees to allow their contact information to be shared for new writers to connect with for advice. Fiction and poetry accepted though strong preference for creative nonfiction. Average word count 500-1500. Pay rate varies based on length and quality of piece between $15-$80.